Arya cashew products Pvt. Ltd. – sister concern of Sahakari Spice Farm read somewhere – places to visit within Goa and finally on the way for a visit to know more about the product tasted since childhood and favorite. A.M. Sahakari – Managing Director was present. Within minutes Dina Bandekar was present too. 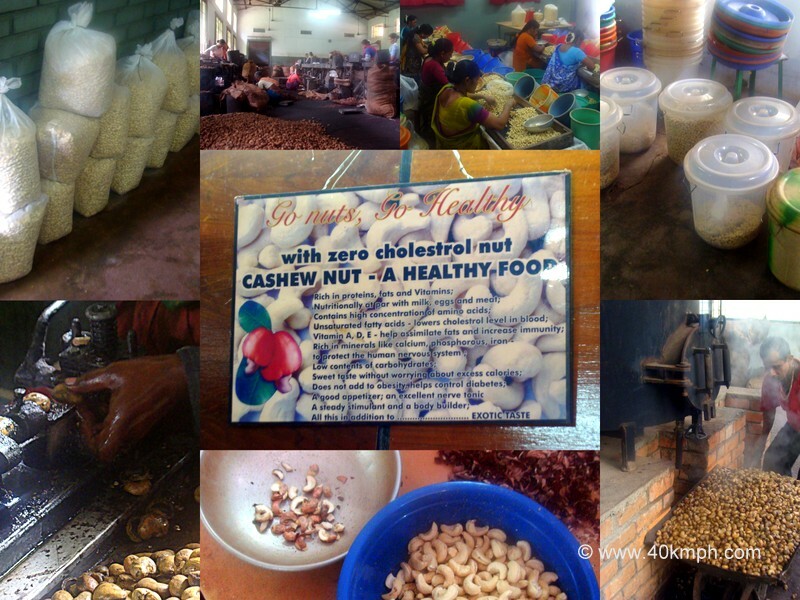 He – The Guide and was requested to show the factory, process of cashew nut. And we were on the way. Dina Bandekar having 30 years of experience within cashew nut industry as narrated during talks while proceeding towards factory. March/April/May – The season – said He. Raw nut is purchased from the market at the rate of Rs. 60 approx. per kg. Mostly purchases are done local as cashew crop is one of the major one. Other than Sindhudurgh, Maharashtra another source and Yes, Sahakari are having their own crop. For 2 days raw cashew is kept under sun-rays. If not, it will be of no use. Boiling plant is within the factory having the storage capacity of 320 kg. 4 bags consisting of 80 kg cashew is added inside. Fire is present that converts water into steam to reach the product. 40 minutes boiling process and cashew is take-out and again one day to get it cool as during boiling it is hot. Â Manual machines are handled by ladies. Now cashew are there to be broken for cashew nut to be taken out. Once all this is done peeling process starts. As cashew nut is having brownish outer layer removed manually which is called polishing which turns cashew nut into white color product. Once all above process is done Cashew nut is almost ready but is within different sizes. Manual sorting is done. There are few broken one too during process which is used by ice-cream makers. And thus whole process is complete. Cashew nut i.e., Kaju is ready for sale. The whole process that started with Rs. 60 per kg is now between 320-600 per kg depending upon the quality of the cashew nut. The process seems to be an easy one but is not that easy because most the job is done manually. The factory operates for 10 months only. January-February it is closed as no work during those months but Yes, half salary is provided to the workers. Currently 80 employees work for the plant and out of 80, 75 are females. Only 5 Men. Females are better with work associated with sitting at one place – said the MD. Since 2004 this factory was owned by Sahakari brothers. Any tourist is welcome to watch the process of cashew without any charges. But Yes, I with a smile gave a small donation to Dina Bandekar. Arya Cashew Nuts is approx. 3.5 km from Haveli chowk, Belgaum National Highway 4A. Turn left (if coming via Ponda town) once you reach Haveli chowk. And will say: Yes, you should visit if visiting Goa. fyi: What we eat (cashew nut) is seed of a fruit.